Sulfacetamide sodium is an ingredient used in the sulfacetamide sodium ophthalmic solution which is an antibiotic ointment or eye-drop to treat different eye infections caused by bacteria. Conjunctivitis along with other eye conditions caused by bacteria like staphylococcus aureus, streptococcus, escherichia coli and streptococcus pneumoniae are commonly treated with this medicine. It must be administered carefully to prevent contamination in the patient. It is considered normal if you have blurry vision after applying the medicine, but if it prevails and is accompanied by swelling, hives and itching, you must seek medical help. Sulfacetamide belongs to a group of sulfacetamide antibiotics, also referred to as ‘sulfa drugs’. It performs a powerful bacteriostatic action and inhibits bacterial growth by limiting the folic acid formation which is essential for the growth of bacteria. You must inform your pharmacist or doctor if you are allergic to sulfacetamide sodium or any other sulfa drug. Sulfacetamide drops often contain many inactive ingredients that can result in allergic reactions. 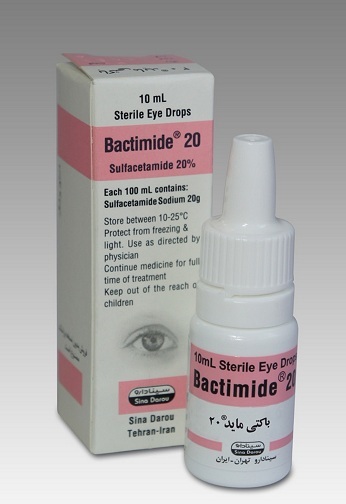 Do not use sulfacteamide sodium ophthalmic solution if there is a fungal or viral infection in your eyes as sulfacetamide sodium is employed for curing bacterial infections only. Do not use sulfacetamide sodium without consulting your health care provider, if you are expecting or are breastfeeding your baby, as it is unknown whether this chemical can harm a baby or not. In case you wear lenses, make sure to consult your doctor regarding whether or not you should continue wearing them while using sulfacetamide sodium. Talk to your doctor about every product (non-prescription or prescription drug) that you are using. Always use sulfacetamide sodium as instructed by your pharmacist or doctor. Always wash your hands before applying the ointment or eye drops. Shake the drops gently to mix them well. Tilt your head a little and place the dropper right above the eyes. Squeeze in one drop while looking away from it. Close the eyes and gently press the inside corner of the eyes for one minute to stop the solution from draining down the tear duct. When applying more than one eye-drop, repeat the above process, keeping an interval of five minutes between every drop. To apply the sulfacetamide sodium ointment, hold the ointment tube for a couple of minutes, making the ointment warm enough to ooze out easily. Apply a very thin layer of the ointment in the lower eyelids while keeping your head tilted slightly. Close the eyes and gently roll the eyeballs 360 degrees for two minutes. In case you are using any other medication with it, apply it after a ten-minute gap. Never touch the tube’s or dropper’s opening to as it may become contaminated and could aggravate your eye infection. Never use eye-drops that have particles or are discolored. Always keep sulfacetamide sodium at normal room temperature. Keep it capped and prevent it from heat and moisture. The general side effects of sulfacetamide sodium include burning, redness, blurred vision (temporary) and stinging. In case these effects worsen or persist, you need to talk to your doctor. Mostly, people do not experience these side effects with the medicine. If you observe that your eye symptoms are worsening and notice a thick discharge, swelling or pain, you should consult your doctor. Sulfacetamide products do get absorbed into your eye, but this happens rarely. If this happens, it can result in serious implications such as swollen joints, body aches, rashes on the cheeks and nose, infection symptoms such as sore throat, fever, symptoms of anemia like rapid breathing, weakness, unusual tiredness and fast heartbeat, symptoms of liver issues like dark urine, persistent nausea, abdominal pain, yellow skin or eyes and vomiting, unusual bruising or bleeding and mouth sores. Severe allergic reactions to sulfacetamide sodium are rare, but if you observe signs such as swelling, rash, itching on your tongue, face or throat, experience dizziness, and have trouble breathing, you must seek professional medical help immediately. Often when you take several products or drugs at the same time, one or more can alter the effect of another. This is why you must consult your doctor and inform them of all the products you are using. When using sulfacetamide sodium, do not change its dosage and do not stop or start or alter the dose of the other drugs you are taking without consulting with your doctor. Products that can interact with sulfacetamide sodium include silver nitrate.